If you’re after a posh or performance SUV, you’ve never had it so good. The booming posh-roader market has meant those with fat wallets and an image to maintain now have more brands to choose from than ever, so Porsche needs to up its game to stay afloat. Typical Porsche Cayenne buyers not only have the Audi Q7, BMW X5 and Volvo XC90 to tempt them away but the Range Rover Sport (or even the Velar), Bentley’s Bentayga and even the upcoming Lamborghini Urus, too. Bearing in mind that three of the Cayenne’s direct rivals are based on similar underpinnings (step forward Q7, Bentayga and Urus), Cayenne v3.0 needs to make sure it stands out from the pack. …and it doesn’t look hugely different from its predecessor, either. In fact, if you parked one alongside its forebear and looked at them from a dead-on front angle, you’d be hard pressed to tell the difference. It’s only when you get to the rear that there are significantly noticeable changes, design-wise; the rear light bar graphic has been carried across from the Panamera and the 718 range, for example. Still, Porsche’s engineers assured us no panel is the same as its predecessor. It’s made from a mix of aluminium and steel like before, but the construction now has a much more aluminium-rich recipe to the tune of 47%. 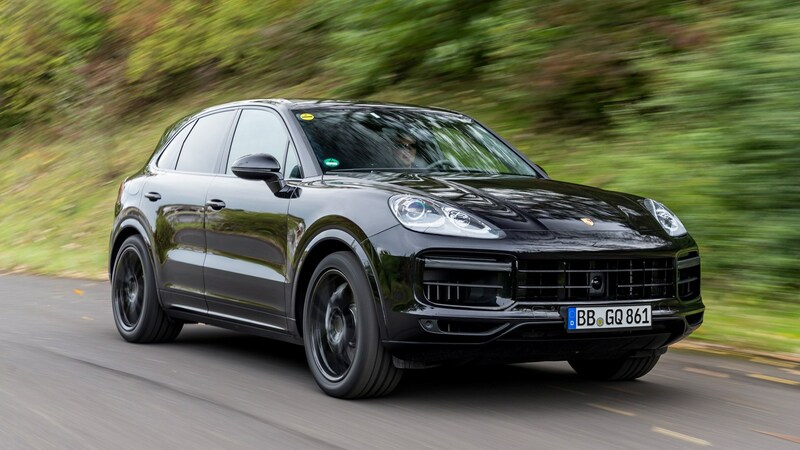 Plus, Porsche claims that the hotter Turbo model is the first SUV with active aerodynamics, as not only do the vents in the grille move to better direct airflow but it has an active rear spoiler that can deploy at speed, or act as an airbrake. Are there more changes under the skin? Beneath the aluminium panels and not-so-different design lies the same basic VW Group ‘toolkit’ derived from the current Audi Q7 and Bentley Bentayga. Your new Cayenne comes with a 48-volt electrical system for suppressing body roll, can be fitted with rear-wheel steering and Porsche-specific three-chamber air suspension, and weight saving measures applied to every nook and cranny mean it’s 65kg lighter than before. One of the most pertinent innovations in Porsche’s deck is a brand new brake option that makes its world debut on the new Cayenne. Called ‘Porsche Surface Coated Brake’, the new system comprises regular cast iron discs that have been coated in tungsten carbide, alongside beefy 10-piston calipers at the front and four-piston ones at the rear. Christoph Bittner says that the PSCB system has ‘all of the benefits of cast discs with the braking power of ceramics’, as the coated discs fade far slower than regular ones and make for ‘more reliable pedal feel’ when you’re hard at it. Another claimed benefit is an approximate 90% reduction in brake dust production, so Porsche specifically painted the calipers white to highlight how clean they would be even after hard use. They’re standard on Turbo models, or available as an option on Cayenne and Cayenne S for £2105 – around a third of the price of a set of ceramics. Been inside the latest Panamera? It’s an incredibly similar dashboard layout, with a very clean design. Gone is the button-fest (to both celebratory cheers and grumbling derision, depending on who you talk to) and has instead been replaced by a massive 12.3-inch full HD infotainment display, haptic feedback touch buttons and more gloss black panelling than Alice Cooper’s Steinway piano. So what were your findings? We had the chance to ride in two different versions of the new Cayenne. The first was on road, in a hot V8 Turbo model, which has Porsche’s new Surface Coated Brakes as standard, while the second was a standard Cayenne S without the beefier brakes and on regular steel springs. They were both pre-production development cars, so there was the disclaimer from our test drivers that some features were a little mismatched as to what will actually end up on the full production run. Plus, bear in mind our rides only consisted of around 10 minutes each. Riding shotgun in the Turbo was all about on-road performance. We first set off in Normal mode for a sighting lap of the ADAC facility, and we found the ride was firm even on the track’s smooth surfaces but bumps were well damped, as if they had a rounder edge to them. Opening up the taps in Sport showed just how muscular the V8 felt even at five tenths and, to our ears, it sounds pretty evocative. Sport Plus was where we spent most of our time on road and revealed the adaptive air suspension working hard to keep the car flat; there was very little roll and turn-in was sharp. 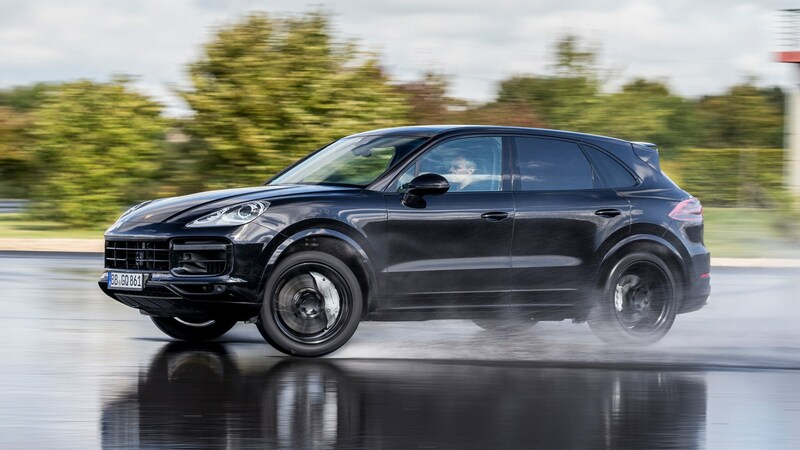 The Turbo also had the Cayenne’s new rear-wheel steering system fitted, and it showed; there was a tactile sense that the hefty SUV was almost pivoting around the corner from a central point. Our Turbo driver, Thomas Reithmüller, also took full advantage of the facility’s skid pan to get the tail out quite considerably. 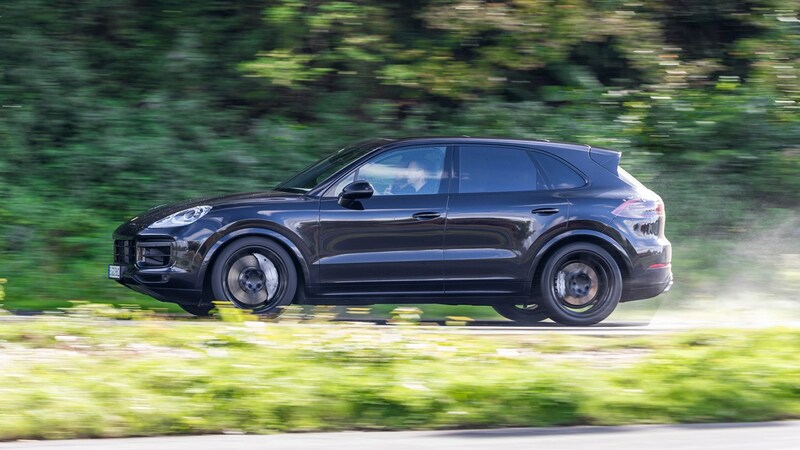 In Sport Plus, the Cayenne allowed the rears to slip on the wet hairpin to produce a progressive slide, then engaged the fronts to pull the big Porsche out of trouble when the steering centred. Porsche calls its all-wheel drive gubbins a ‘hang-on’ system – apt. We then hopped into a Cayenne S for our off-road gallivant, first using the gravel setting on the off-road submenu of the drive select system to traverse a shingle-strewn track, which the regular suspension mode handled without difficulty. The next challenge consisted of two extremely steep rocky climbs. Switching into Rock mode unfortunately doesn’t start an Aerosmith concert but primes the suspension for sudden camber changes and properly aggressive terrain. The first steep hill was dealt with in minimal time and with minimal fuss from the all-wheel drive system, as the road tyres maintained their composure through up the rutted and steep terrain. It also gave our off-road test driver, Jochen Möchl, the chance to activate the hill descent control. The second incline was… less successful. The incline was similarly steep, but the crest of it was off camber and angled to the right. The same procedure was engaged, so our Cayenne girded its loins and progressively tackled the craggy track… right up to the crest. A wheel-consuming dip in the track brought our Cayenne to a juddering halt, and Jochen’s self-admitted heavy presses of the loud pedal only made our SUV crab backward. 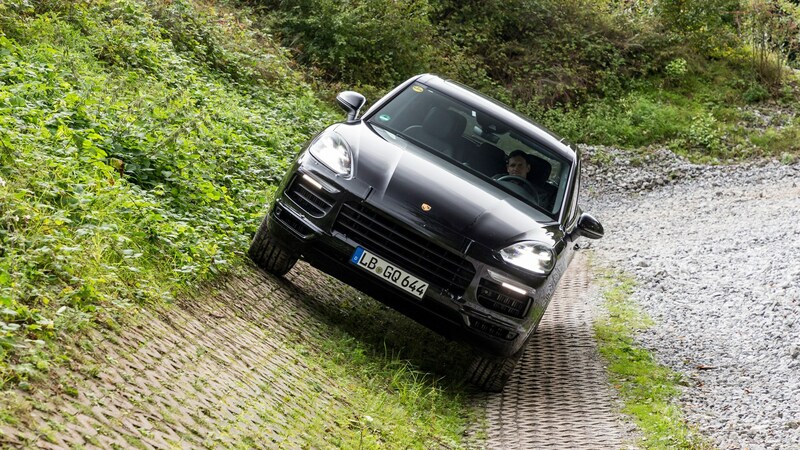 If nothing else, it proves that Porsche’s go-anywhere utility vehicle can still be caught out; it doesn’t prove the Cayenne isn’t good off-road; instead it shows how much the driver still needs to exert their technique to get the most out of it when tackling the roughest terrain. At face value and from the wrong side of the car, our brief demonstration showed that the Cayenne can still (mostly) tackle a light sprinkling of rough stuff, and that the Turbo feels like a bit of a weapon. But we’ll obviously have to drive it for ourselves to give you our definitive verdict – sorry.